"What I am is God's gift to me. And what I become is my gift to God." I have heard from my parents that after some long waiting God had heard the prayers and the longings of their hearts, and I was born. In the process of growth, their devotion to God, their trust, faith and confidence in God had developed my vocation. It had inspired me to see the inner beauty of mine. The above-mentioned quotation was striking me. I saw my life as a precious gift of God and I asked myself what I could give to Him. 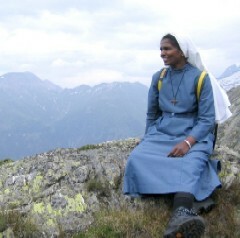 Seeing the Ursuline sisters in my parish, the thought became clearer to me and after having finished my studies, I decided to give my life to God and join the Society of St. Ursula in Pune, India. So in June 1991, I joined the Society of St. Ursula, which has the Provincial House in Pune, Shanti Ashram, Vadgaon Sheri, and the Generalate in Switzerland (Kloster St. Ursula, Brig). The formation made me grow spiritually, and I got to know the Society and its Charism, which the foundress, Mother Anne de Xainctonge, had begun. Her motto was: "To live is Christ and Death is Gain. Carrying little lamps, which will throw the light on the path of girls, of women and the needy of her time." In the midst of various experiences, God has guided me, step by step, in order to deepen my call and to make Him known through me. From 2003, I have been helping in the infirmary of the "Kloster St. Ursula, Brig". I am happy in all that I am and in all that I do.